Post your pics here, from anywhere in Miami, Fort Lauderdale, and the Palm Beaches. Comments are welcome. No more than one or two pictures per message, please. 800x600 or smaller is preferred, panoramas excepted. If you have a collection that you would like to share with us, please start a new topic. Happy belated Fourth of July... Here's how Bank of America Tower looked leading up to Independence Day. I'll post my version when I get them developed. Were you downtown for the fireworks? Did you see the big "One" spelled out on One Miami? Here's an oldy from me, but one of my favorites. ^ Great picture, very Manhattan-esque. I didn't get to make it downtown on the 4th... too many other things going on. Did you get a picture of the "One"? A picture of a Miami-Dade Fire Rescue engine. I've always loved the lime-green color. They feel so tropical, so "Miami" (even though City of Miami uses traditional red). MDFR vehicles are lime-green to help them stand out better in traffic. Miami-Dade Fire Rescue serves 30 of 35 municipalities and all of unincorporated Miami-Dade County. It's the largest fire department in the Southeast and the 7th largest in the United States. Fire in downtown Miami, site of the "future" Miami River Lofts. Miami at night, looking northwestward. maybe it's the angle but I was expecting more of a Chicago style grid. It's the angle, which is northwesterly. If you look at the upper 3/4 of the picture, you'll see the MIA control tower. Check the bottom left and you can see more defined parallel lighting. Channel 10 used to end their nighttime news broadcast with a westward view from the Wachovia Tower... it's more what you were thinking. Bank of America Tower is green right now... I'm trying to think what holiday it might be... Sure isn't St. Patrick's Day. I dug up this picture from a couple years ago. Cool thread! I don't have any pics of Miami, so I'll just read. I'm a big fan of that Bank of America building... please keep us posted on all of its color changes. Palm Beach County pics are more than welcome. That's my goal. Stay tuned! Don't have those either lol. It appears that you go against the traffic on your way home from work huh? That's great! 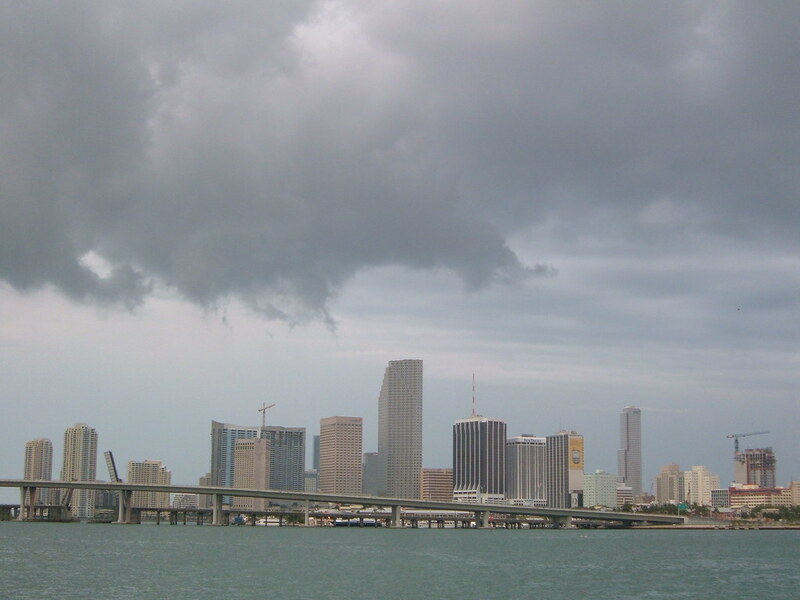 Downtown Miami before the rain. 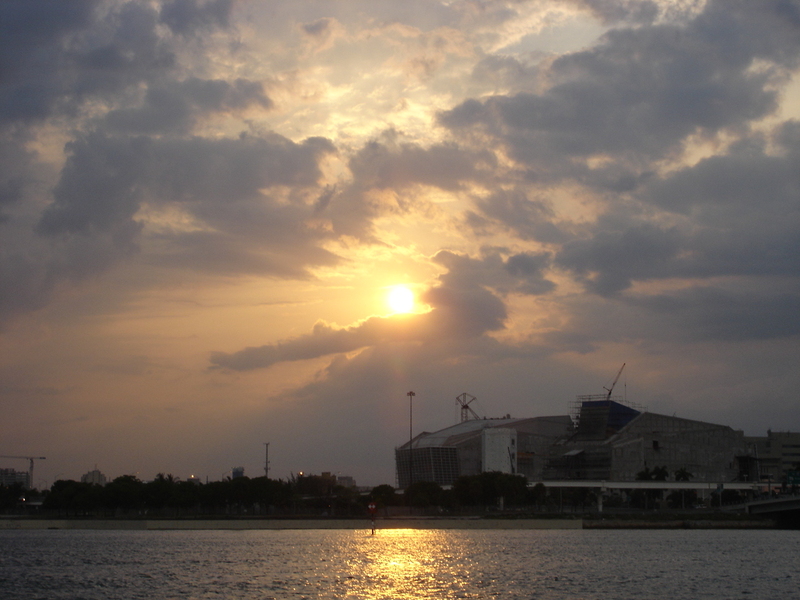 The Performing Arts Center, under construction, viewed from the Bay. It's going to look really nice when it is finished. Northbound Biscayne Boulevard @ about 7th street. Excellent... I have one of those looking south that I'll post when I find it. This is a picture that Brickell posted earlier... thought I would bring out the color in it as much as possible to see how the picture would look.